Yes cross bracelet is huge, but I LOVE IT and I promise it looks way better in person. It is so great and a Round Top/Warrenton find. I wore it to the Junk-O-Rama Prom Thursday night (hosted by Junk Gypsy) and received lots of compliments. Who knows maybe they were really like"crazy lady what the hell do you have on." 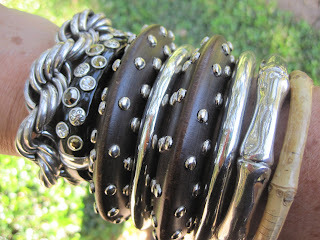 I have been asked several times to blog about accessories and such so this is it (or the beginning of it). What I would like to try is show how I mix my nicer jewelry with great lesser expensive jewelry and how it all still can look great. 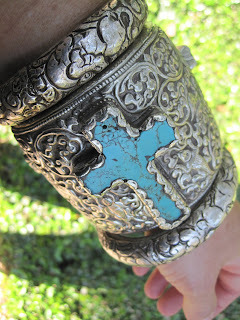 To start I did get the three bracelet's this week during the Antique Fair, the smaller ones were $125.00 each and the much larger turquoise cross was $400.00 after talking Vincent down $80.00. 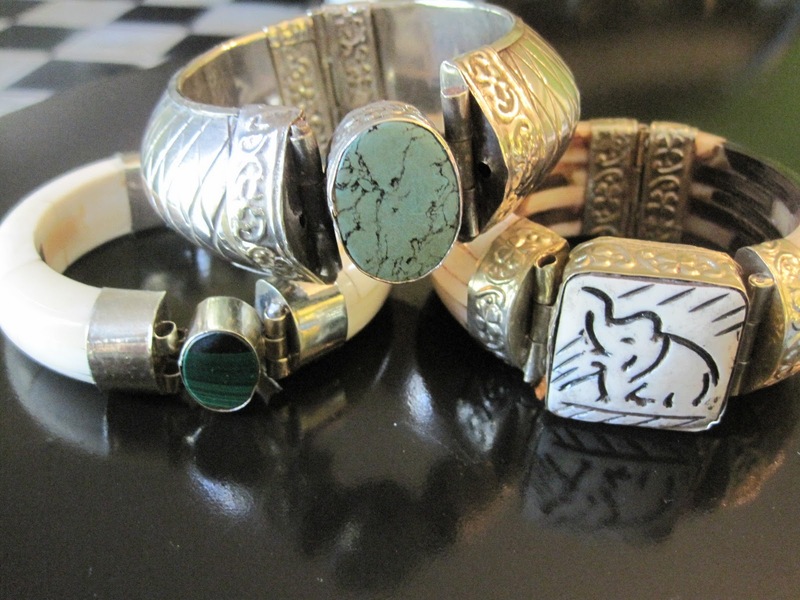 They are sterling silver and made in Tibet and definitely not your everyday find. I looked all over the Round Top Antique Fair and only found two dealers selling Tibetan jewelry. These bracelet are fun and everyone always thinks they are ivory, so why not let them, right? Except I'm letting my secret out now, they look like ivory and are a great faux finish but since I found them on clearance at Wal-Mart (in Marble Falls, TX) for $3.00 and that was for five bracelets, I'm going to say they are NOT ivory but they are metal and a faux finish. I found them on clearance in black too! The larger bracelet is a bangle in ivory and green malachite, it's hinged and highlighted with brass. I found it on eBay and won the auction for $10.50 and $3.50 for shipping. It was a great deal. The most expensive item on my wrist in this picture is the Michael Kors bone watch. You should invest in a couple great looking (not to trendy) watches, Michael Kors is a great designer and his watches start at $200 and go up. Try to grow your watch collection to include a great summer, fall and dressy watch, then you can always add trendy from their if you really need it or can't live without it. If you are like me it's always that you can't live without it. Doesn't everyone want to look fabulous. I have some bamboo bracelet's and have a huge tendency to wear them a little to much, but when the Saks catalog came and these were in there my worries went away. If Saks and Gucci are ok with it then who am I to argue. The ones pictures are Gucci and start at $1,000. Now we all know I like all things Girlie and beautiful and everyone has their limit and mine is controlled by the Judge (A.K.A. the husband) so NO I do not have the Gucci Bracelets but I was lucky enough to find great silver looking ones on Harwin (you can find EVERYTHING there) for $2.00 each. 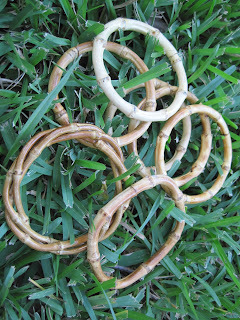 Plus I have some natural bamboo ones that look great also. Hopefully you can tell, but that is one of the bamboo silver ($2.00) bracelets. Mixed with two other Harwin finds and a newer Brighton bracelet. Which I am still amazed it's a Brighton bracelet. I'm not usually a fan, but this was fun and a great addition to add to the mix. Rhinestones are not my thing, and I am a FIRM believer that you can make things go a long way and mix up all kinds of wonderful pieces if you leave the rhinestones alone. They can tend to make things look cheap if your not careful. 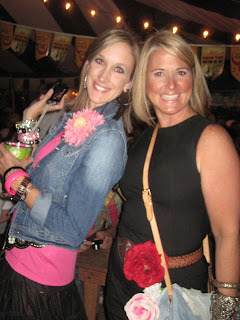 I realize the Brighton bracelet has stones, but I did not "bling" it up my arm. Sure add a piece here and there, and there is always a fun place to wear the rhinestones and glitz,but not everyday. This is only my opinion. I also feel you should wear your jewelry in a unique way that is you and makes you confident and happy. So if rhinestones do it for you, claim your style and make it your own. Who am I to say. These are the natural ones, I love wearing and mixing. Almost everything I buy or invest in is mixable. A girl needs options, especially in her jewelry, handbags and shoes. It makes the clothes easier. In later pictures you'll notice these mixed with other bracelets. They were eBay finds and very affordable (don't say cheap, sounds like you got it from the gumball machine). Around $11.00 with shipping for 5 bracelets and the other two were misc finds. A great women once told me that you should never tell a women her jewelry is cute because it's like giving a compliment to a five year old about her shoes. Point being a women doesn't want to hear her jewelry is cute, it's beautiful, looks amazing, makes her outfit complete and her shine. I meet that women when I was probably ten or twelve years old and she was much older, She was always perfectly put together and looked incredible she introduced me (and my mom) to many fabulous things, and I know without a doubt she helped to shape my fashion sense and sensibility. She's like my personal Coco Chanel. I've always adored her, Mrs.Jones. These bracelets were an accidental find, but I was so lucky to get them. They are vintage and believe it or not, there are 23 on my arm. They have a tortoise look and range in width from super skinny to wide. They are a eBay find and at first they may sound like a lot, but remember there are 23 bracelets, all for $71.00, so that's $3.09 each. The auction was a all or nothing deal, which was perfect for me. The watch is Michael Kors tortoise and again, watches are great investment pieces. Look for timeless over trendy first. Here's a motley crew of bracelets. But an example of how I often mix it up for better or worse. The first bracelet(closes to my wrist) is definitely one that would fall in the "investment" piece category, it's a DeCarol and all her pieces are one of a kind, heavy solid sterling silver and what you can't see is the beautiful toggle and cross on the other side ("investment" piece is a bigger purchase and I'm leaving the price off on purpose). This is on my top five faves maybe even number one. The next is the Brighton one we have seen before, the third and fifth are wood with silver and were a steal at $6.00 each at Target on clearance. the three silver bracelet all came from Harwin and were only a few dollars and of course I couldn't leave home without one natural bamboo bracelet. My new interest in bracelets. Hinged ivory. 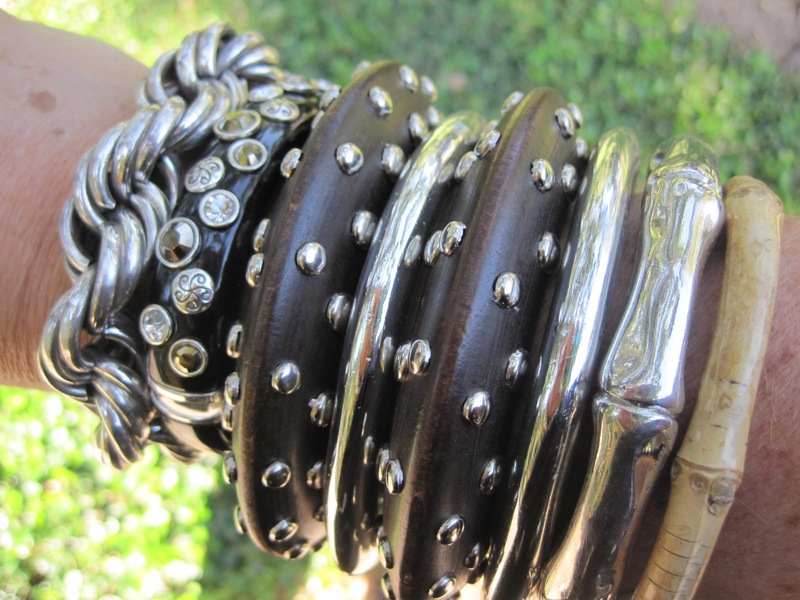 While in Round Top I found several of these bracelets, but purchased zero! The prices were eye popping, the cheapest I found these past two weeks was $150 for a super skinny one and plain, and the other was $350 for one that is similar to the ones I have. So were did I get mine, eBAY. If you haven't guessed I love eBay, the things you can find. If you can think it up you can find it on eBay. Back to jewelry, I've mentioned the ivory and green malachite bracelet and winning it with shipping for $14.00. The silver engraved hinged bracelet with the turquoise was just as great a find for $19.99 and $3.75 for shipping. We can't forget the elephant, it's the biggest and inlayed with ivory and hinged, I think it adds a mix of the unexpected which I like, it was only $34.99 including shipping. I won all three bracelet for under $73.00 (including the shipping) and I'm bidding on one more, which hopefully I will get it and then that will be it for the ivory bracelets. Well, it can't be all about bracelet, but I will get back to them. Michael Kors says every women should have a great pair of diamond stud, even if they are just cubic zirconium. 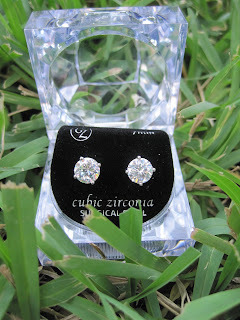 The CZ studs he suggest are $90 a pair and the ones I have pictured and wear all the time are $10.00 and are available in any size, from super tiny to unbelievably large, you also have the choice of silver prongs or gold and several shapes, but why be tacky, stick with the traditional round. Email me if you need a pair or two. I lose earrings all the time so I buy a few at a time. I've never been a dangle earring person. I'm trying, but when you are into a certain piece of jewelry, like I am bracelets I really think it's over kill when you then add a ton of necklaces or giant earrings on with it. Pick and choose your favors and highlight those. Sure ten bracelets are a lot but big earrings and a chunky necklace with it and who will know where to look and what to say. Find your style not someone else's and if you need help, ask friends or give me a email. We all need a pretty and simple pair of leopard heels.They do not have to be Kate Spade (I do LOVE these, how precious is that bow). I just adore this pair and wouldn't mind seeing these in my closet, but at almost $400.00 they must wait. The pair I have is perfect for now. Use leopard print in pieces not complete outfits. I have a leopard pencil skirt but I would not wear it with my leopard shoes or bag. Keep your animal prints simple and best advise, one animal print on your body (includes handbag) at a time. An example, I have on a plain black sheath dress, my leopard heels and my signature millions of bracelets and diamond stud earrings. No necklace and no leopard handbag. I was carrying a vintage Furla Croc Handbag that evening. I'll show another picture of this dress another way. A simple solid color sheath dress is a super background for any accessories you want to highlight and look stylist doing it. A different look in the basic black sheath dress (I have this dress in navy and chocolate brown), This black one was another eBay win. It was new with the tags and I was the proud owner for under $30 with shipping. I have just recently bought a blue and white boucle knee lenght sheath on eBay as well for $17.99 and a Gray GAP one for $13.50 (including shipping) and I'm currently bidding on a Ralph Lauren Black Label Black wool one for the winter and a Calvin Klein. So see people I can find a deal. Back to this picture (Kristen sorry for the red eyes), I wore the black dress with a vintage tooled belt and a great big buckle and added a big red flower clipped to my belt and of course lots of bracelets and you can't see me feet, but I have one Cowboy boots in black patent leather with turquoise stitching and a white flower clipped to my boot. It was a special night,not your everyday outfit, but not bad. If this post is a hit I'll do more style post. Just comment and let me know, click on the comment box and send, then I'll post them later. You will not see your comment immediately.